Silicon Valley is known as the startup capital of the world. It's where entrepreneurs go to raise money, develop their tech platforms, and find investors. But one city known for the maritime industry is emerging as one of the fast-growing tech scenes outside the U.S.
Oslo, Norway's capital city, experienced a 160% uptick in startup investments in the past year, according to Oslo's 2017 State of the City report. That's the second biggest jump in the Nordic region behind Sweden, up 171%. "There's a booming startup scene in Oslo," said Tellef Thorleifsson, a founding partner of the Norwegian VC Northzone. "But it's still in the early stages." Norway is the eighth wealthiest nation in the world due in part to its biggest export: oil. It was recently ranked as the happiest country on Earth by the United Nations 2017 World Happiness Report. The country's sovereign wealth fund just topped $1 trillion dollars last month. But in recent years, Norway has had to compete with lower oil prices in the Middle East and Venezuela. Now, its leaders are looking to eco-friendly tech as the next big money maker -- a natural evolution for the country, which has long been committed to sustainability. It's currently one of the only countries to have a tax on carbon emissions, and the government offers a 25% subsidy for fuel efficient vehicles. Related: Where are the world's happiest countries? "If you're gonna solve the world's biggest issues today, you really need technology and innovation," Crown Princess of Norway Mette-Marit told CNN. 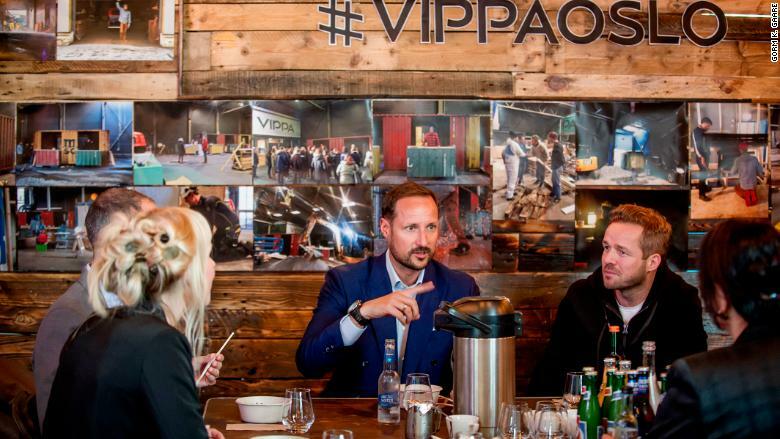 Crown Prince Haakon and Crown Princess Mette-Marit are encouraging more entrepreneurs to take advantage of investors interested in funding socially minded startups. Last year, there were 78 investments in Norwegian tech companies -- totaling $100 million, according to the 2017 State of the City report. About 15% of tech investments in the country were focused on sustainability, the highest among all the Nordic countries, research firm Nordic Web finds. Other northern European cities such as Denmark and Helsinki have some cache for producing successful tech startups like Spotify and Rovio, maker of Angry Birds. "The quality of the entrepreneurs we see [in the country] now compared to 10 years ago is a lot higher, " said Thorleifsson of Norwegian VC Northzone. Thorleifsson was an early investor in Spotify and has a diverse portfolio of digital tech companies -- the majority of which are from Scandinavia. Northzone is an investor in the Norwegian company Kahoot!, a game-based learning platform primarily used in schools. It boasts 50 million monthly unique users. "There's a lot of capital in Oslo and a lot of money going into tech," said Kahoot! CEO Erik Harrell. 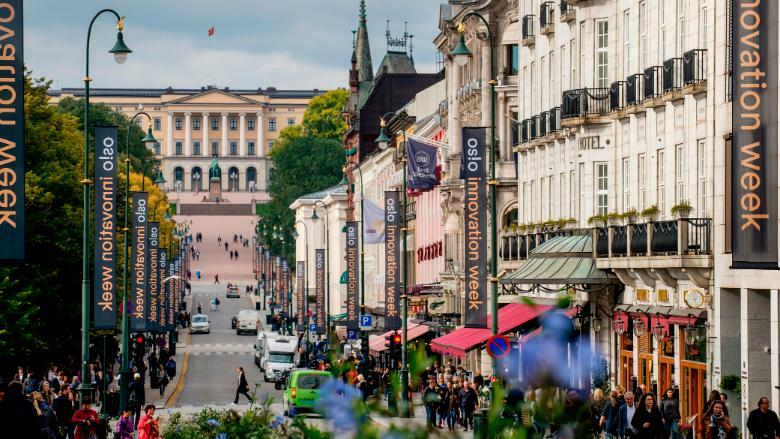 "I think those elements helped make Oslo a good place to start companies." While most of Kahoot! 's users are in the U.S., 85% of their funding is from Scandinavia. "We found getting funding in Europe was fairly easy," said Harrell. "The Nordic venture capital community is fairly small so getting access to [VCs] wasn't that difficult." While Norway's startup scene has a lot of momentum, the country has only produced one unicorn: the blockchain platform, IOTA. Blockchain is a data base for cryptocurrency, which is not regulated by a central governing body and is used heavily in developing countries. This year alone, Silicon Valley added 44 unicorns. A unicorn is a startup valued at over $1 billion. But since 2014, Silicon Valley's share of global unicorns has decreased by almost 50%, according to Northzone's analysis of data published in the Wall Street Journal. Meanwhile, the number of unicorns in Asia and Europe has grown significantly -- up 400% and 700%, respectively -- in just three years. 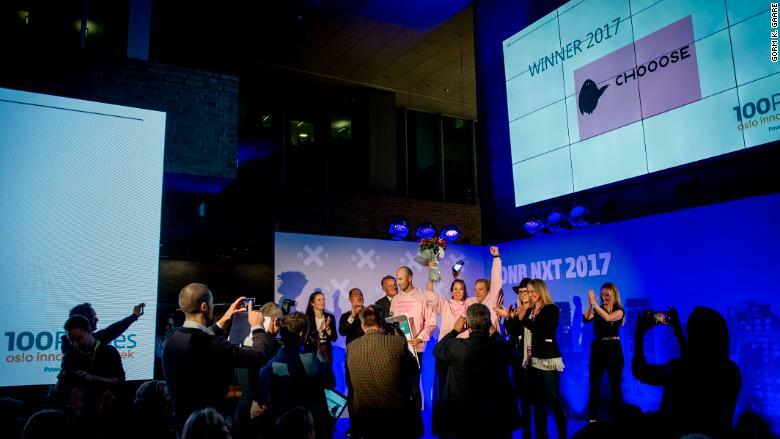 Startup CHOOOSE wins a pitch event at Oslo Innovation Week for its work elminating carbon emissions. Martine Kveim of CHOOOSE, a Norwegian-based climate change platform, sees that as an advantage. "[Norway] is still much less mature compared to many other parts of the world, which opens up great opportunities for attentive investors," said Kveim. One of those investors was Nordic Impact, a VC firm that invests solely in companies with sustainability-focused business models. It was an early investor in the nearly year-old startup CHOOOSE, which focuses on eliminating the carbon footprint of big businesses. The company works with the UN Framework Convention on Climate Change and the EU Emissions Trading System to sell carbon emission quotas to the average person and socially-conscious companies. The process of purchasing carbon quotas is typically reserved for big corporations with a large carbon footprint. The move makes the carbon quotas less available for big polluters. "[We've had investor interest] because we've found a good way to connect idealism with green capitalism," said Kveim. "Our experience is that impact investing opportunities attracts people that have a lot more to offer than funding." Anders Lier, the chairman of of Nordic Impact, believes there is more money to be made from companies focused on sustainability. "[Young people] want to buy good products that are good for the planet, and they're willing to pay premium prices for it," Lier said. As startups continue to grow and look for funding, some are attracting attention from outside the country, too. "Many investors we're [talking to] now are coming from outside of Norway," said Kveim of CHOOOSE. "The vision and mission of the company seems to have no borders."